Welcome to the iOS family. 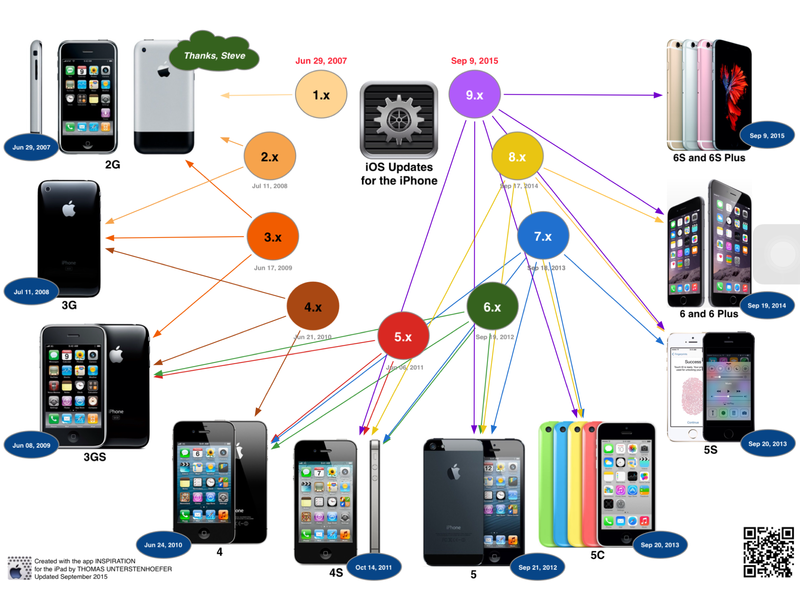 See this concept map (created with the app INSPIRATION on an iPad) which shows all iOS versions in relation to all iPhone models on which they can be installed. Some people argue that less fragmentation isn’t as important as Apple officials tell us on the company’s yearly events. Well, stats about iPhone device share (Localytica, 2014) tell us that usually more than 60% of iOS users are on older devices (with a higher percentage for the iPad) but like to benefit from improved OS versions. This is proofed by extremely high adoption rates (>80%). Jobs made it to one of the core principles of Apple. Less fragmentation is just one of the benefits Apple brings to its customers and it’s possible because they build both, hardware and software. Customers love the durability of their iPhones giving them an extraordinary resale value. Beside customers thousands of happy developers can see their apps running on old iPhone young timers, a not to be underestimated economic factor. Of course not all features of updated operating systems are available for older devices. 3D-Touch for example needs a new touch screen technology. if you are interested in creating awesome infographics.